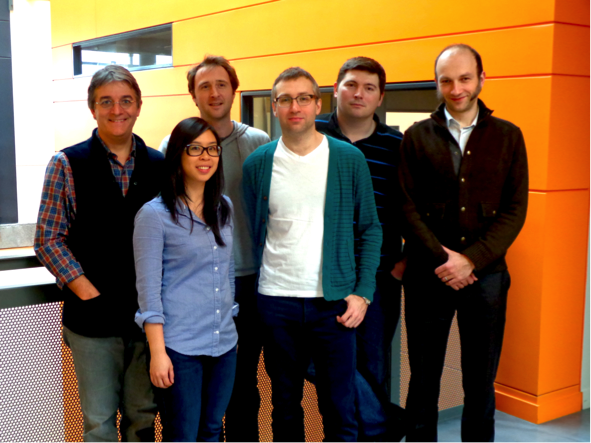 [Left to right] R. Martel, N. Y-Wa Tang, E. Gaufrès, F. Lapointe, N. Cottenye, T. Szkopek. 2Regroupement Québécois sur les Matériaux de Pointe and Department of Electrical and Computer Engineering, McGill University, Montréal, Canada. Raman spectroscopy is a technique used to probe vibrations in molecules. When monochromatic light is shone onto a substance, the resulting inelastic scattering is referred to as Raman scattering. Raman signatures are characterized by a series of very narrow peaks (2 nm), which are assigned to different vibrations and are very useful to identify molecules. Nowadays, Raman is used to characterize bulk substances in liquid or solid form, and can also be used for chemical imaging of heterogeneous surfaces [1,2], However Raman scattering is characterized by a very small cross-section, in the order of 10-30 cm2 for non-resonant material such as water and in the range of 10-24 cm2 for resonant structures such as dyes . That represents an intrinsic limitation in the context of “label free” Raman imaging where bulk samples are required. Detecting a variety of different molecules at very low concentrations requires Raman nanoprobes with strong and specific emission. Surface enhanced Raman probes have been developed to improve the cross-section of Raman scattering. An amplification by a factor about 108 is commonly reported on these systems . But this strategy requires a metallic surface, which can be cumbersome at time due to cost, stability and size control issues. One of the main focus of Prof. R. Martel’s research is the study of carbon nanotubes, which includes electronic transport, optical properties, functionalization and also their interaction with other molecules . 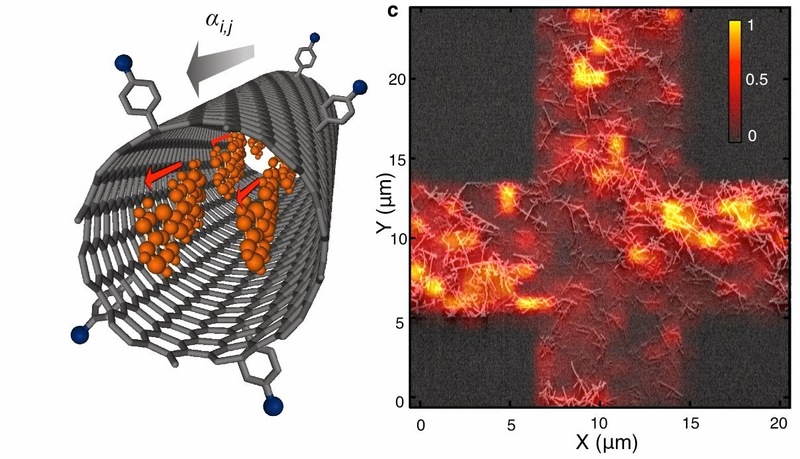 We performed many different studies with Raman and electrical transport on molecule-nanotube assemblies, but the α-sexithiophene encapsulated in SWNT (6T@SWNT) attracted much of our attention. This hybrid material was previously studied for organic electronics and optoelectronic applications and we noticed an unusual intense signal that came from only hundreds of molecules of encapsulated α-sexithiophene (6T). We noted that the C=C stretching vibrating mode along the axis of the molecule of 6T at 1450 cm-1 at a laser excitation on 532 nm was almost as intense as the band observed at 1590 cm-1, which is ascribed to the vibrational tangential modes of the SWNT. The SWNT is a material known to have one of the most intense Raman signal in resonance and the intense band of 6T was therefore a clear indication of signal enhancement. In our most recent work published in Nature Photonics , we explain the origin of this Raman effect, and show that other molecules encapsulated in SWNT also exhibit an enhanced Raman scattering. The Raman scattering of SWNTs is so strong that it is possible to identify one individual carbon nanotube using our custom-built Raman spectrometer. Performing the experiments on an individual SWNT and an isolated 6T@SWNT allows us to disregard averaging effects and other optical phenomena such as energy transfer between adjacent SWNTs. A rough estimate of the Raman cross-section of encapsulated 6T aggregates can be inferred using the SWNT signal because it could serve as an internal reference. The internal reference technique is based on the deposition of a material having a well-established cross section value in close proximity to the object of unknown Raman cross section. Considering some geometrical and optical parameters we can compare directly the signal of the studied object (here the 6T aggregate) with the reference (here the SWNT). This way allows us to assess the differential cross section while avoiding complicated calibration for the Raman setup transmission and other reflextion effects. Using laser excitation at 532 nm (an RRS condition for both 6T and SWNTs) and the highest spatial resolution (600 nm) of our microscope, the Raman bands of the 6T at 1450 cm-1 and of the SWNT at 1590 cm-1 exhibited nearly the same integrated peak intensity (6T/NT =0.7). Considering that the RRS cross-section of the G-band of an individual SWNT is 1 X 10-21 cm2 sr-1, we estimated the cross-section of the 6T J-aggregate to be roughly the same. We confirm this estimate using a separate experiment based on another internal reference consisting of a graphene sheet, which provides a better precision to the estimate. Figure 1. Left: Scheme of a Dyes@SWNT. Here the α-sexithiophene molecules are encapsulated inside SWNT (6T@SWNT). Right : Superposition of a SEM image with the map of the Raman intensity of deposited of 6T@SWNT as a cross pattern on a substrate. Our first hypothesis to explain this unusually large cross-section was that strong optical resonances in the SWNT can produce an optical antenna effect similar to a SERS mechanism. That is, the scattering efficiency can be reduced or enhanced by the optical near-field at the interior of the SWNT. The strength of this effect was estimated by modeling the SWNT as a hollow cylinder with an infinitesimal wall characterized by an optical frequency conductance g. This estimate shows that the small SWNT diameter, as compared to the optical wavelength, renders optical enhancement or screening ineffective in the visible spectrum. These calculations were corroborated experimentally by using 6T encapsulated in individual metallic SWNT and semi-conducting SWNT. Carbon nanotubes can be classified in 2 broad categories: the metallic SWNT (m-SWNT) and the semi-conducting SWNT (s-SWNT), depending on their chirality. They have very different electrical and optical properties. For instance, m-SWNT and s-SWNT have resonances at different laser frequencies, 633 nm and 532 nm respectively. Following the hypothesis that 6T is enhanced by the nanotube resonance, we would expect high 6T intensity only when the tube is in resonance. This means that the 6T Raman intensity in a m-SWNT would be the highest at 633 nm and the lowest at 532 nm, and vice versa for 6T intensity in a s-SWNT. This is not what we observed; therefore we rule out that Raman enhancement of the dye is due to the strong resonance of the SWNT. The Raman scattering enhancement of the 6T must then come from the dye itself. According to High-Resolution Transmission Electron Microscope images from Loi et al. [REF 7], it was determined that the 6T in nanotube do pack in a very ordered and define way. They arrange in pairs along the axis of the tube. This special head-to-tail alignment is well-known in the field of molecular self-assembly, and are described as J-aggregates, and show unique collective properties. In our case we believe that the ordered assembly of 6T due to the confinement provided by the nanotube is responsible for the giant Raman cross-section efficiency of the 6T@SWNT assembly. Furthermore, this enhanced Raman scattering was not a process unique to 6T, other chromophores also behaved in a similar way as shown in Figure 2. Figure 2: Hyperspectral Raman images at 532 nm of different Dyes@SWNT deposited on a substrate in micro-bundles form (left) or individual form (right). Finally, we further studied the Raman properties of this hybrid material with the aim of testing their possible use as a Raman label technology. First, a robust covalent functionalization of the SWNT external sidewall did not affect the 6T Raman signal. That is, we found that the nanotubes protect the dye from the environment. We also noticed that the carbon nanotube protect the dyes against photobleaching by the laser beam and supresses the fluorescence of the dyes, which normally overwhelms and mask the Raman signal. 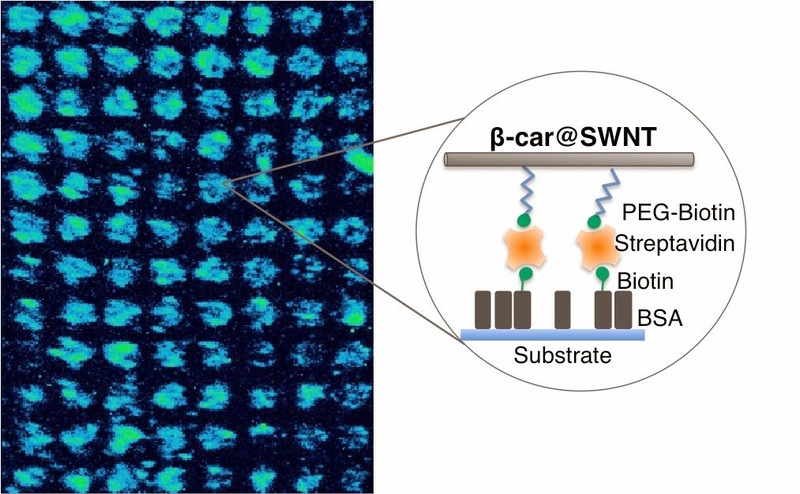 Figure 3: Streptavidin recognition by -car@SWNT on a functionalized surface using PDMS stamping. These general properties of dye@SWNT nano-assemblies thus make them well-adapted for constructing a library of Raman labels with unique signatures for hyperspectral imaging and tagging experiments. In this perspective, the Figure 3 shows preliminary results on a biodetection experiment with protein recognition on a surface. The 6T@SWNTs serve here as Raman labels to image the immobilized streptavidin on the surface. The major advantages of these Raman probes are their facile synthesis, unique signatures for multiplexing applications and a robust signal that is unaffected by the environment and protected against photobleaching. Pascal Puech, Stéphane Pinel, Renato G. Jasinevicius, Paolo Sergio Pizani. "Mapping the three-dimensional strain field around a microindentation on silicon using polishing and Raman spectroscopy". Journal of Applied Physics, 88, 4582-4585 (2000). Abstract. Committee on Revealing Chemistry through Advanced Chemical Imaging, National Research Council, "Visualizing Chemistry: The Progress and Promise of Advanced Chemical Imaging". ISBN: 0-309-65256-1. National Academies Press, USA (2006). Link. Sangdeok Shim, Christina M. Stuart, Richard A. Mathies. "Resonance Raman cross-sections and vibronic analysis of Rhodamine 6G from broadband stimulated Raman spectroscopy". ChemPhysChem, 9, 697-699 (2008). Abstract. Paul L. Stiles, Jon A. Dieringer, Nilam C. Shah, Richard P. Van Duyne. "Surface-enhanced Raman spectroscopy". Annual Review of Analytical Chemistry, 1, 601–626 (2008). Abstract. Phaedon Avouris, Richard Martel. "Progress in Carbon Nanotube Electronics and Photonics". MRS Bulletin, 35, 04 (2011). Abstract. E. Gaufrès, N. Y.-Wa Tang, F. Lapointe, J. Cabana, M.-A. 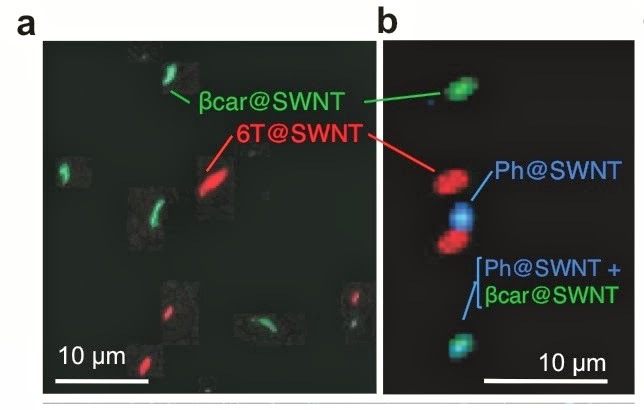 Nadon, N. Cottenye, F. Raymond, T. Szkopek, R. Martel, "Giant Raman Scattering from dyes encapsulated inside SWNT for Multispectral Imaging", Nature Photonics, 8, 72-78 (2014). Abstract. Maria Antonietta Loi, Jia Gao, Fabrizio Cordella, Pascal Blondeau, Enzo Menna, Barbora Bártová, Cécile Hébert, Sorin Lazar, Gianluigi A. Botton, Matus Milko, Claudia Ambrosch-Draxl, "Encapsulation of Conjugated Oligomers in Single-Walled Carbon Nanotubes: Towards Nanohybrids for Photonic Devices". Advanced Materials, 22, 1635-1639 (2010). Abstract.